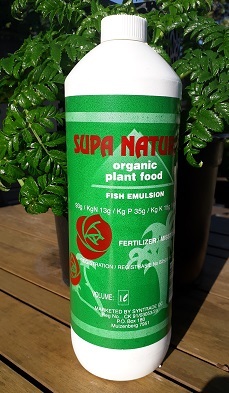 Supa Natural Fish Emulsion is a completely natural organic liquid fertilizer which will not burn or harm your plants. 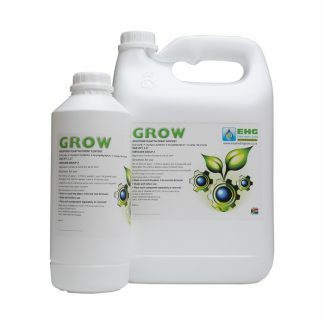 It is derived from fish and is suitable as either a foliar or root feed. 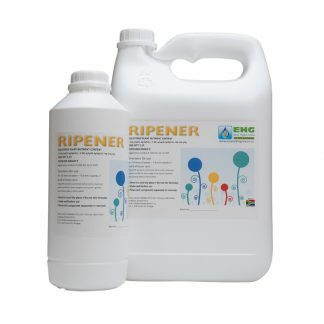 Can be used in your garden, lawn or pot plants but is not suitable for hydroponic systems. Storage: SUPA NATURAL will keep indefinitely in concentrated form, however, once diluted will last only a few days. Being a natural products, it contains no preservatives. Leaf analysis performed in accordance with procedure as laid down by the Dept. of Agriculture. SUPA NATURAL FISH EMULSION, being derived from fish, is a protein source. Nitrogen (N) is a protein component and is a growth stimulant. It is an enzyme component and enhances the plant metabolic processes. Nitrogen is a necessary component an photosynthesis and is absorbed, in the case of SUPA NATURAL FISH EMULSION, as nitrate(NO). Phosphorus (P) is an important component as it activates organic matter. Phosphorus speeds up the ripening process and enhances root development. Potash (K) is important in that it improves the water retentive properties of the plant. 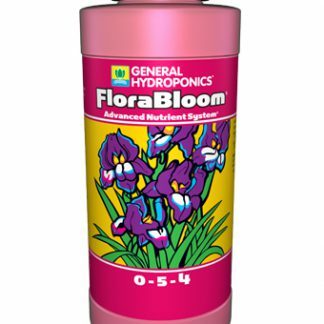 It increases resistance to drought and frost. Potash improves the absorption capacity of the root system and is vital to the reproduction stages of the plant. Sulphur (S) enhances protein synthesis and is therefore evident as a symptom of N starvation. The trace elements are all enzyme components and assist with the generation of the enzyme systems. For continuous watering, 50 ppm N is sufficient. i.e. in sandy soil, the dilution of the solution would be 1 : 8000, 0 – 5% humus 1 : 2600, 5 – 10% humus 1 : 3600. THE MORE RETENTIVE THE SOIL, THE LESS DOSAGE IS REQUIRED, AS LESS OF THE NUTRIENTS ARE LEACHED OUT. Foliar feeding is not a substitute for root feeding. However, it is a useful method of making up any shortfall in the nutrient requirements of a plant. It can also enhance the absorption capacity of the root system. As absorption through the leaves is rapid, it is a good method of administering a nutrient “booster”. It is very useful if the plant has a root impediment, e.g. old citrus trees with knotted or rotting roots, or if the climatic conditions (drought, temperature extremes) affect the normal transport of nutrients within the plant, or if the soil conditions are not ideal. Foliar feeding is also used on young trees with a fragile root system. It encourages the roots and the foliage until the root system is strong enough to support normal growth. DOSAGE: A dilution of 1 : 450 is ideal as this will provide a Nitrogen (N) concentration of 200 ppm.